Leftover frittata (broccoli, spinach, and bacon) doused in Cholula. We love Cholula here at our house. I made semi-crunchy frittata for the longest, before I finally started cooking the veggies first. 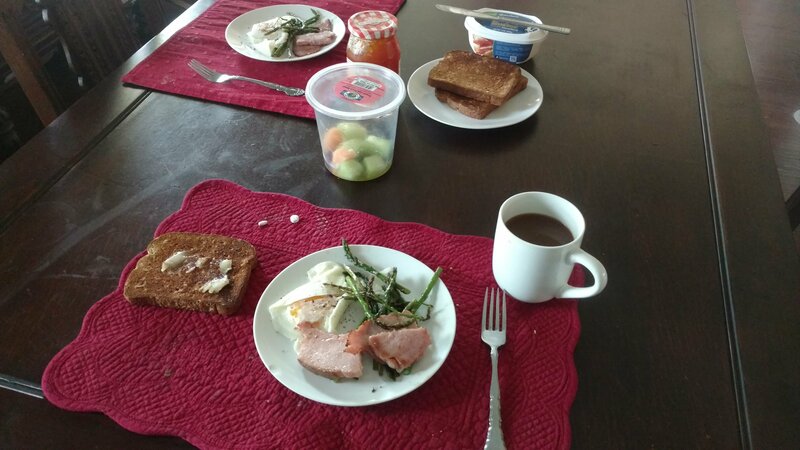 Cage free eggs over medium, roasted asparagus and tomatoes, sweet potato crackers, coffee. Just finished: 1 boiled egg, half an avocado, Community Coffee Dark Roast. 4 scrambled eggs with Frank's RedHot and a lot of coffee. 2 egg Parmesan cheese omelet topped with Trader Joe's Salsa. Eggs over medium, sauteed red peppers and tomatoes, sweet potato chips, cantaloup and coffee. This morning was almond croissant French toast, bacon, dark cane syrup and a few mixed berries, and coffee. The wife has spring break this week, so I made some bacon and a dozen-egg frittata. This morning was toasted croissant, bacon, a few mixed berries, and coffee. + Hard boiled eggs, and a homemade flourless peanut butter cookie. Typical for last week, as well as for this week ... including the meds. Egg over medium with ham and avocado, and a homemade peanut butter cookie, with coffee. Quaker Oatmeal Squares, w/ walnuts & raisins. Side of sliced Opal apple. Homemade scones ... Cinamon-raisin, cranberry, blueberry. Boiled egg. Coffee.